Four-toed salamanders are widely distributed across forested regions of the eastern United States, with many disjunct and isolated populations throughout. This species was first discovered in Minnesota in Itasca County in 1994 (Dorff 1995). Since that time, it has been documented in five additional counties in east-central Minnesota. The four-toed salamander was listed as a species of special concern in 1996 due to its tendency to occur in small isolated colonies and its vulnerability to habitat destruction. Four-toed salamanders have 4 toes on each of their front and hind feet. Other terrestrial salamanders in Minnesota have 5 toes on their back feet. This species averages 5-10 cm (2-4 in.) in total length (Petranka 1998). Its base color is red-brown with dark flecks on its sides. The belly of adults is white with black markings. Unlike other species of salamanders in Minnesota, the tail of the four-toed salamander may become detached from its body near a constriction at the base of the tail. Throughout their range, four-toed salamanders live in mature upland deciduous or mixed deciduous-coniferous forests interspersed with sphagnum seepages, vernal ponds, or other fish-free habitats that serve as nesting sites (Pfingsten and Downs 1989; Petranka 1998). Mature closed-canopy forests provide favorable conditions including a shaded moist forest floor with organic soils and woody debris. Mature forests also encourage the growth of moss around pond margins (Petranka 1998). Upland forests provide cover, foraging sites, and overwintering habitat for juveniles and adults. Egg deposition and larval development occur in wetland habitats devoid of fish, often with a sphagnum component. In Minnesota, four-toed salamanders occur most frequently in mature forests of glacial moraine landscapes where such isolated wetlands are abundant. 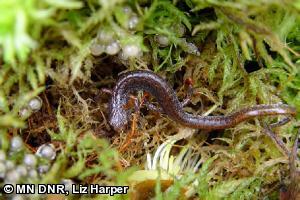 Courtship and mating of four-toed salamanders occur in upland forest habitat in autumn (Petranka 1998). During courtship, males and females engage in a tail-straddle walk prior to the deposition of spermatophores by the males (Petranka 1998). During late fall, four-toed salamanders congregate with other amphibians near overwintering sites. Specimens are rarely found during winter months and presumably spend the winter in subsurface retreats (Petranka 1998). In the spring, females emerge from overwintering sites and migrate to nest sites between late March and mid-May (Petranka 1998); typically late April to early May in Minnesota (Hall and Carlson 2004). Wetlands utilized during the nesting season range from small seasonal ponds without fish to perimeters of large conifer swamps. Egg clusters are often laid in moss hummocks adjacent to open water. Such mounds of sphagnum are often established at the base of alders along a wetland edge or near cover logs that have fallen into the wetland. Females lay approximately 30 eggs in the moss slightly above the water line and remain with the egg cluster for at least the first few weeks after oviposition (Petranka 1998). Communal nesting can occur where one female guards several hundred eggs laid by multiple females (Pfingsten and Downs 1989). The time of hatching and larval development varies depending on breeding dates and local site conditions (Petranka 1998). Larvae generally hatch from the eggs in 1-2 months, wriggle free from the moss, and drop into adjacent shallow pools. Larval development ranges from 21 days to 6 weeks in length, after which time transformed juveniles emerge from the wetland (Petranka 1998). Young terrestrial salamanders remain near the wetland edge, dispersing into the adjacent forest 2-3 weeks after transformation (Petranka 1998). Four-toed salamanders reach sexual maturity roughly 2 years after hatching (Petranka 1998). Their lifespan in the wild is not known, but a captive four-toed salamander was known to live for 9 years (Harding 1997). Limited research on the diet of four-toed salamanders has identified food items as small invertebrates including insects and their larvae, spiders, snails, and worms (Harding 1997). Throughout their range, four-toed salamanders are typically found in small, isolated colonies that are vulnerable to catastrophic events or drastic habitat alterations. The unique breeding habitat requirements (moss hummocks adjacent to both open water and mature forest habitat), and the limited dispersal capabilities of this species put its isolated populations at great risk. In Minnesota, the greatest threat to four-toed salamanders is loss and degradation of upland forest habitat and wetlands that are utilized as nesting sites. Where this species is known to occur, forest management and recreation activities should be designed to reduce impacts to four-toed salamanders and their habitats. The distribution of four-toed salamanders throughout the forest is highly dependent on temperature, moisture, the presence of woody debris, and suitable nesting sites. Management guidelines have been drafted to aid state resource managers in protecting important habitat features for this species (Hall and Carlson 2004). Recommendations include a 50-foot no-cut buffer zone around wetlands known to be used as nesting sites and the retention of some adjacent forest habitat to create corridors connecting wetlands. This interface between wetland and upland habitat provides cover for transformed juveniles vulnerable to desiccation. Forest roads and recreational trails should be minimized and not cross wetlands known to be used as nesting sites. Run-off from logging roads and forest trails into wetlands, vernal pools, and streams should also be avoided. Lastly, the use of herbicides is not recommended in known or suspected four-toed salamander habitat. More information on the distribution, abundance, movement, and ecology of this species in Minnesota is needed. The four-toed salamander is designated as a Regional Forester Sensitive Species in the Chippewa National Forest and surveys are to be conducted in proposed management activity sites that contain appropriate habitat. Within the DNR, the Minnesota Biological Survey conducts surveys for four-toed salamanders in counties with suitable habitat. These efforts have resulted in five additional county records between 1994 and 2008.